The Alaska fishing season is slowly getting here. Alaska’s winters can be harsh and cold but home to some of the most stunning surroundings and events. While we might be bundled up and not fishing every day, we are out enjoying our winter activities. These include the world-famous Iditarod dog mushing race, snow machining, skiing, sledding, snow shoeing, and let’s not forget ice fishing! While winter blankets our state with white snow and the northern lights brighten the dark skies, we are eagerly awaiting our summer! The land comes alive and the waters break up, giving way to the schools of fish heading upstream. We start the summer season out with a big bang! Monstrous king salmon push their way upstream and everyone’s hope is for a king that may break the state record! If you’re looking to use your upper body strength to reel one of these giants in, this is the time to jump on the boat! King season continues on into mid summer with the season ending by the first of August. By mid July the second run of sockeye salmon are usually in the river in big numbers. From the boat or from shore, sockeye salmon are a fun fighting fish that can really keep you moving all day! They are a great fish to catch for all ages, and a warm time of the year to fish too! If your lucky to visit Alaska in an even year (2014! ), your rod will double its chances at getting a fish! Pink salmon reemerge into the Kenai river during even years and crowd the rivers alongside other salmon during these years. 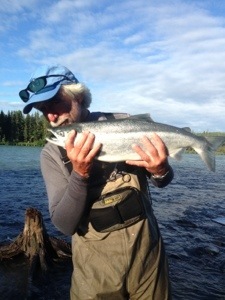 If you’ve been to Alaska fishing before and are in need of returning, someone who just needs to get away, or if your new to visiting the beautiful state of Alaska, Drifting On The Fly is your guided fishing service to beautiful surroundings, a great day on the water with great fishing, and lots of stories to remember! Give us a call to book your favorite date and lock it in today before all the dates are filled! Booking or questions about fishing or Alaska in general? Call (907) 382-6808 or send a message to scott@driftingonthefly.com.